A research, review & rating site for handgun laser sights. Excerpts from and links to all our info pages for Ruger-specific laser sights. Rating: 6.0/10. From 5 votes. This entry was posted in $101-$150, Frame, Red, Ruger, Viridian on February 6, 2014 by Staff. 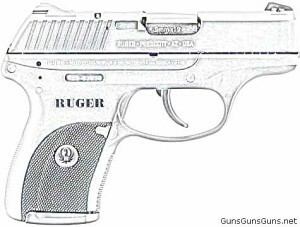 In recent years, pocketguns have surged in popularity, and Ruger‘s LC9 and LC380 pistols have sold particularly well. If you own one, you’ve probably thought about adding a laser sight to it, but where to start? These guns do not feature an accessory rail, eliminating universal-type lasers as options. This entry was posted in Frame, Green, Red, Ruger and tagged Laser Sight Roundups on December 3, 2013 by Jed Henson. This entry was posted in $1-$50, $51-$100, ArmaLaser, Frame, Red, Ruger on October 26, 2013 by Briley Kenney. This entry was posted in $101-$150, $151-$200, ArmaLaser, Frame, Heckler & Koch, Red, Ruger, Springfield Armory, Taurus, Walther on October 26, 2013 by Briley Kenney. This entry was posted in $1-$50, $51-$100, Aimshot, Frame, Red, Ruger on October 22, 2013 by Staff 4. Rating: 4.6/10. From 8 votes. This entry was posted in $101-$150, $51-$100, Frame, Kel-Tec, LaserLyte, Red, Ruger on October 19, 2013 by Staff 3. Rating: 3.9/10. From 8 votes. This entry was posted in $101-$150, $151-$200, $201-$250, Frame, Green, Ruger, Viridian on October 17, 2013 by Briley Kenney. Rating: 2.5/10. From 2 votes. This entry was posted in $151-$200, $201-$250, Frame, Green, Ruger, Viridian on October 17, 2013 by Briley Kenney. This entry was posted in $1-$50, $101-$150, $51-$100, Crimson Trace, Rail, Red, Ruger on October 17, 2013 by Briley Kenney. This entry was posted in $101-$150, $151-$200, $201-$250, $51-$100, Frame, Green, LaserMax, Red, Ruger on October 15, 2013 by Staff 4. Rating: 5.0/10. From 1 vote. This entry was posted in $101-$150, $51-$100, Frame, LaserMax, Ruger on October 15, 2013 by Staff 4.